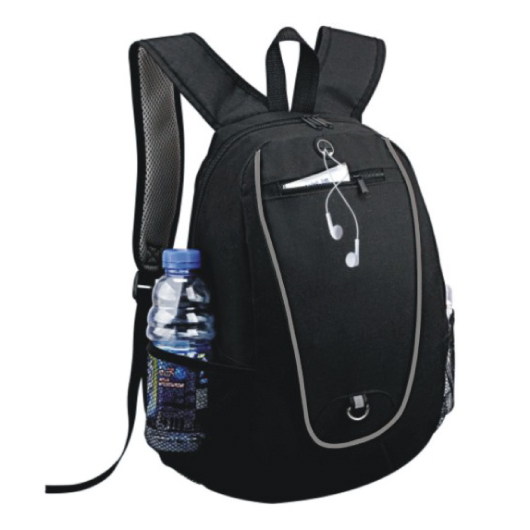 Take this sporty and stylish backpack with you to school, the park, or even just walking around out with your friends! Make sure you're fully prepared for your next outdoor excursion and bring a premium pack to carry your gear with this comfortable backpack. Made from 600D polyester for durability and has comfortable double shoulder straps. It has a top zipper closure, a roomy main compartment, and two side pockets. It also features a reflective pen clip, front pocket, rubber earphone outlet, padded back panel, and grey piping.